Daniel Chester French frequently used the trope of wings. It connects to his studies of birds ("I was an ornithologist before I became a sculptor"), and links with the Trancendentalists with whom French is frequently associated. 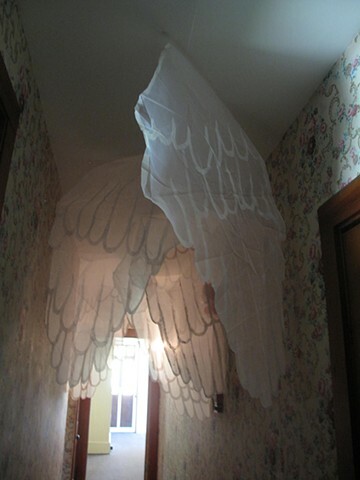 These wings are made of sheer fabric, and installed in French's house in such a way that the visitors are literally brushed by them as they pass underneath, creating the sense of entering a different zone; of passage, of being touched by other-worldliness.